Photograph courtesy of Arkansas State University Riceland Distinguished Presentation Series. The newly elected Arkansas Attorney General in 1977 was asked to speak at the Arkansas State University commencement. He agreed. The day was hot and rainy. The ceremony was supposed to be held on the football field, but the weather pushed it into the air condition-less field house. Bill Clinton knew exactly what to do. He trimmed his speech down to six minutes, much to the delight of the graduates and their families. 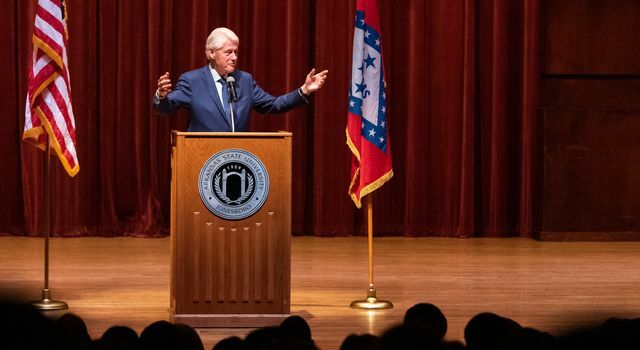 Clinton, who would go onto to serve as governor and was elected to two terms as President of the United States, spoke Monday (Feb. 11) at the Riceland Distinguished Presentation Series on the Arkansas State University campus in Jonesboro. Clinton wasted no time in blasting modern politics and took veiled shots at President Donald Trump even though he didn’t invoke his name. Clinton’s wife and former First Lady, Hillary Clinton, was defeated by Trump in 2016. He noted that he thinks public service is a full-time job and Trump has been under scrutiny in recent days after it was revealed he spends hours each day in unscheduled executive time. As our country has evolved, we’ve made strides to remove all types of bigotry in our society, he said. But, one type is crippling the country’s political system and our elected officials ability to pass effective legislation. Clinton is famous for his storytelling prowess, and he credited his upbringing in rural Arkansas in the post-World War II era for the skill. The former president, who was born in Hope but grew-up in Hot Springs, didn’t have a television until he was 10. The lack of entertainment meant people had to tell each other stories, he said. One of the best storytellers in his young life was his uncle, Buddy. Uncle Buddy would let the future president tell a story if he listened to one first. Once, long after Clinton had been elected governor he went to visit Buddy, who’d already lost a lung from cancer and whose wife was in essentially a nursing home due to Alzheimer’s disease. Each morning his wife called and asked him why he left her there. Each day he would drive to visit her, but by the time he arrived she couldn’t remember him. Clinton listened intently and at the end of the story he told his uncle he had to go, his uncle grabbed him by his arm. He had tears in his eyes. “It’s pretty tough sometimes, isn’t it?” he asked Buddy. “I signed on for the whole load and most of it was pretty good,” Buddy said. Clinton said he formed special bonds with former presidents George H.W. Bush and George W. Bush. Clinton defeated the elder Bush in 1992, and was succeeded by the son in 2001. He called the younger Bush early in his presidency and even though there was animosity from his father’s bitter loss, the two struck up a friendship. During the younger Bush’s two terms, they spoke frequently, Clinton said. The two former presidents have formed a presidential leadership program. About 60 candidates are accepted into the program and they meet with Bush and Clinton and visit their libraries. They also go to Lyndon Johnson’s and George H.W. Bush’s presidential libraries. At each, they study major decisions made during each term, and the thought processes that went into those decisions, Clinton said. When the program is finished they have a final ceremony with both presidents. Most of the time, the Republican-leaning candidates come to speak with Clinton, and the Democratic-leaning candidates talk to Bush. This century will provide a host of challenges that the American people will have to come together to solve, he said. It’s the most exciting time in history to be alive, and if we can heal never ending “mud slinging” and craft good national policies our country could achieve a new century of greatness, he added.